I’ve written in the past about my love for spinning and my constant attendance at the spin studio just down the hill, YAS. YAS, however, went belly up and closed just before Thanksgiving. It was a loss. I’m friends with many of the instructors. I took spin and the occasional yoga class there at least 4X a week. It was a constant in my fitness life. In the weeks following its closure, I was involved with a group of former instructors who wanted to take over the lease and reinvent the space. The cost was too dear for them, but luckily another partnering of regular clients occurred, and the space reopened as Hype Silver Lake on January 6. The former entity, YAS, was an LA based chain. It was extremely regimented both in its spin and yoga approach. There was a set order for each in terms of spin positions and yoga poses. There was no variation allowed. Traditional yoga lexicon and spirituality was banned. While all this regimentation meant it was easy to train new instructors (only trained the YAS way), it also meant my body got used to the routines quickly. Eventually, I stopped feeling the workouts, and my body followed suit. It was frustrating. Well, no more of that. Hype seems all about letting the instructors stick to their area of expertise and explore it to its fullest. The spin and yoga programs are run separately. Each spin instructor makes up their own progressions with constant changing up of speeds, hills, and positions. The new bikes are awesome. The sound system has been improved. Former YAS instructor Mark Torres took over the spin program, and he is enthusiastic about mixing it up. His approach is working; there’s no more sleep riding through a class for me. The yoga is a complete change. I’m pilates trained and certified, and have never enjoyed yoga very much. But Hype’s yoga could change that. It’s now the opposite of the YAS “yoga for athletes” nonsense; I heard my first “om” last week in the new space. I’ve now taken yoga from three different instructors and each class was, indeed, entirely different. The yoga props are in play. The vocabulary is more traditional. And the yoga feels nurturing and relaxing, especially if taken right after a spin workout. Hype was smart in hiring an experienced and serious yoga teacher (and former YAS employee), Leah Kercheville, to reinvent the yoga program. Hype is the only spin studio for miles, and it is totally committed to being a neighborhood space. 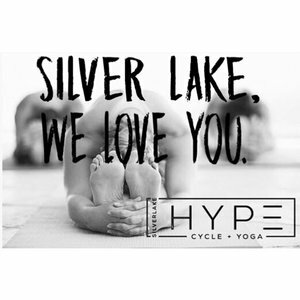 The marketing for it is “Silver Lake, we love you.” In a world where anything new coming into a neighborhood is usually a Starbuck’s, Hype is a welcome exception to the corporatization of local businesses. General manager (another YAS alum) Chris Gamel is that rare find of both warmth and utter efficient professionalism. The front desk staff is friendly and knows your name. There’s lemon water in a dispenser on the counter. There are regular community rides scheduled. Hype even did former YAS clients a solid by honoring class packages for the first month. If you live in the area, in Los Feliz, Franklin Hills, Silver Lake, Atwater Village, or even Echo Park, you should definitely go to Hype. It’s a true example of a business created by a community need. Help it succeed!